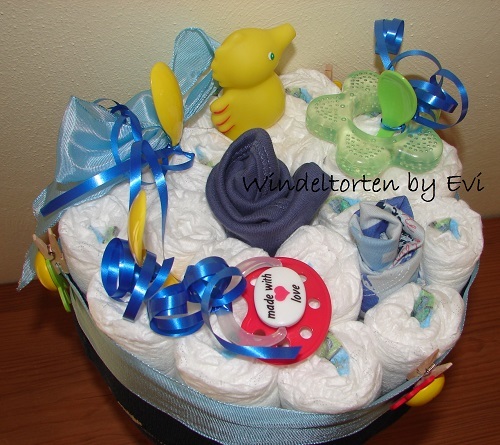 Want to give pampers and to present them nicely? 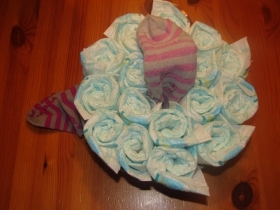 Make a unique diaper bouquet! 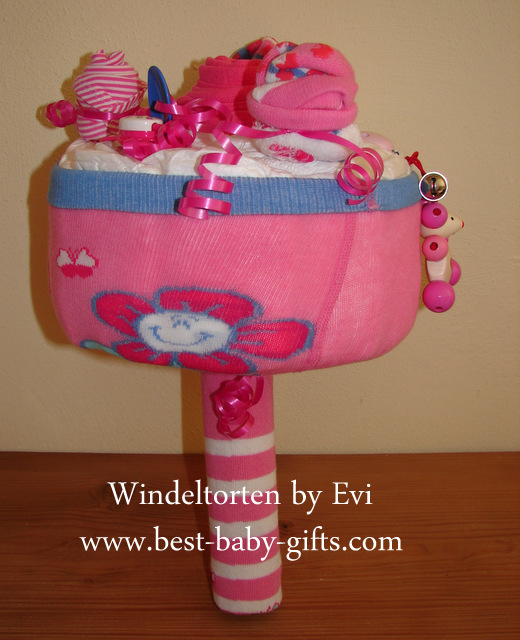 Need a beautiful baby shower decoration? 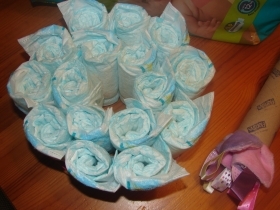 Make lots of bouquets out of pampers and some simple embellishments! This beautiful gift idea helps you to 'disguise' simple and practical necessities such as pampers, clothes, baby spoons, teething helps, pacifier clips, etc. into a really stunning 'bunch of flowers' that can be used up completely. 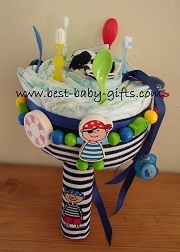 Let me tell you, how the idea for this unique bouquet made of diapers and small baby items came into my mind. I created it myself and as far as I know, nobody else has ever made a baby bouquet that way! I went to see a friend of mine who just had had a baby. 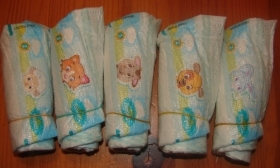 For the baby, I had a sound ball, a pair of baby tights and a cuddly baby label cloth (Taggies). And I was wondering how I could wrap this up in a nice way. The sound ball was too big to incorporate into a crafts project, as I realized pretty soon. So I just put it in a gift bag. 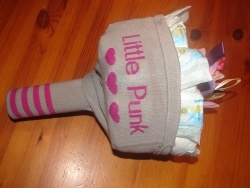 But for the tights and cloth a diaper bouquet came into my mind. At first I wanted to include the tights into the top and squeeze them somewhere between the diaper flowers but then I had a much better idea: the tights fit perfectly as a kind of 'vase' for the whole bouquet! 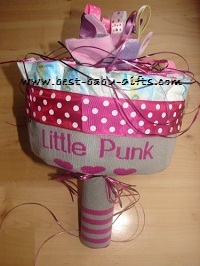 This baby gift craft is absolutely easy to make and my step-by-step instructions are complemented by lots of photos. 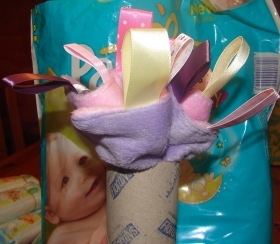 This is the tutorial for the rolled version, for the stacked nappy bouquet version, click on the link further down. - a label cloth / taggies or a cuddly toy or a baby cloths/burp cloth or a little towel/blanket/wash mit or a baby tee/baby onesie / baby socks, etc. 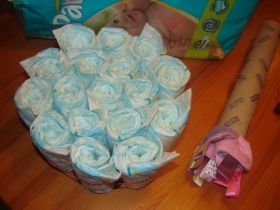 As said before, for this kind of bouquet, the diapers are rolled. Roll them and fix them with a rubber band at the lower end. It does not really matter which way you roll them, just try out which way you like best. 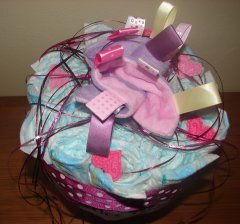 Unlike for a diaper cake, you can roll the diapers pretty loosely and you don't have to do this very accurately. 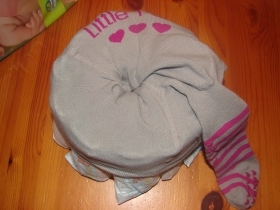 Take one of the rolled diapers as your center and position approx. 6 more diapers around it, fix them all loosely with a big rubber band. 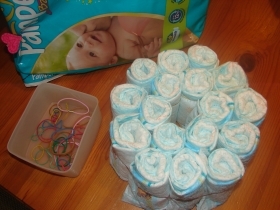 Place your 3rd diaper layer around the 2nd layer, inside the big rubber band. The 3rd layer should be approx. 10 diapers. Remove the center diaper, leaving a whole in the middle. Take the empty kitchen paper roll and stuff your Taggies into the upper part. It still needs to stick out a bit at the top. The Taggies works very well since all these labels make a very cute center. If you have a cuddly toy, squeeze the toy in the paper roll, if necessary cut the roll a bit open. Take your diaper base upside down and then put the tights over it. 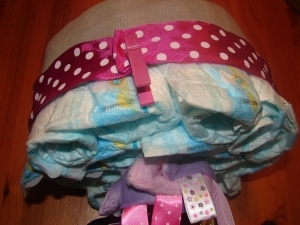 About one third of the diapers should stick out and two third should be inside the tights. After doing that you can remove the large rubber band. Turn the base around again and pull one leg of the tights through the 'hole' in the middle. You need to reverse the leg to do so. Insert your kitchen roll with the cloth through the hole in the middle and push it down inside the remaining leg of the tights. If the tights are too long, just hide the end (heel) inside the tube. Squeeze the other leg either through your kitchen roll, too or squeeze it between the paper roll and the diapers - just as it fits better. Cut a piece of ribbon and lay it around your bouquet right over the rim of the tights. Fix it with just a little drop of glue and a cloth peg. The cloth peg can be removed once the glue has dried. Decorate your 'bunch of flowers' with more ribbons, and other accessories. For this baby girl bouquet I have used 5 little pegs with felt hearts attached. I have also lavishly added thin straw ribbons in various lilac color shades. By the way, Taggies make a cute and educational baby gift. They promote development of fine motor skills and hand-eye coordination. And packed in a diaper bouquet they are even cuter. 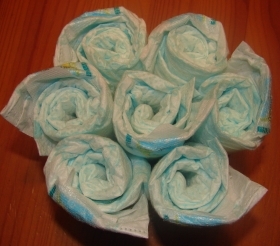 Tutorial for a stacked pampers bouquet here.